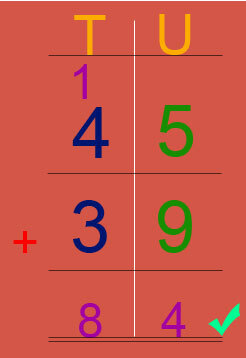 This lesson includes step by step guidelines on how to add two digit numbers with regrouping. 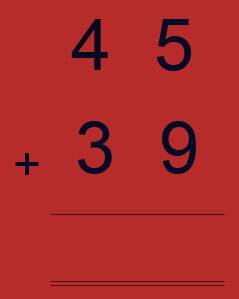 But your answer will be wrong, if you place number 14 like the way shown below. 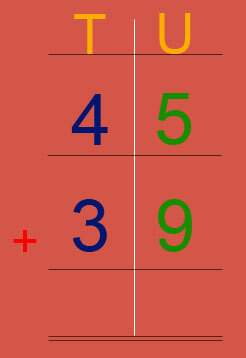 WE CANNOT PLACE A NUMBER WHICH IS GREATER THAN 9 UNDER ANY PLACE VALUE LIKE SHOWN IN THE ABOVE PICTURE. How to place a number greater than 9 in the Units Column. 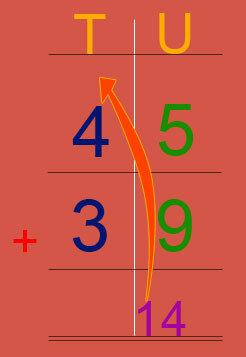 Place number 14 in its correct place values. 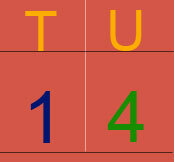 1 belongs to the Tens column whereas 4 belongs to the Units column. Place the digits correctly under the two columns. Now add the Tens column. Click here to try more two digit addition or other addition activities and worksheets.